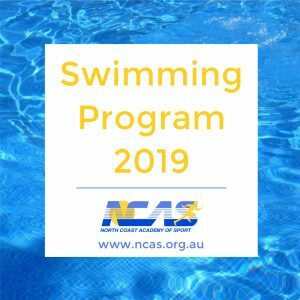 The North Coast Academy of Sport is about to launch a pilot Swimming program with program partner Trinity Aquatic Centre, Lismore. The program will begin with a Trials & Development Camp on the weekend of the 18th & 19th May 2019. We envisage the 2019 program will run from May to October. To identify, recruit, develop and manage talented junior athletes on the North Coast. To identify, recruit and mentor talented coaches of junior athletes on the North Coast. To provide those athletes & coaches with access to clearly defined pathways in swimming. To maintain a swimming program of excellence. The program will be delivered through weekend camps and training days. Pool and land-based programs will be offered for each athlete, with athletes being encouraged to complete a program commensurate with their age, experience and technical efficiency. Sports science including video analysis, ergometer and blood lactate measurements will be used as part of the regular testing procedures for the more advanced athletes. These sports science components will also assist in the professional development of satellite coaches. Pool Swimmers: Australian Age, Multi-Class, or Open Championship Qualifiers and other talented athletes within 5% of qualifying times for these events are invited to apply to be part of this new and exciting program. Please refer to Swimming Australia’s website for these times. Athletes other than pool swimmers: applicants from another sport e.g. SLS surf sports or triathlon will be required to demonstrate potential capacity to progress to standards as mentioned above. Athlete applicants to be 12 years of age or over in 2019. Considering the test results, perceived potential and prior competition results, athletes may be invited to join the program. Coaches of selected athletes will be invited to apply for satellite coach positions within the program. This enables the coach and athlete to progress together, with the coach being mentored by the Head and Assistant Coaches. Should a coach wish to apply for the program without an associated athlete, the Academy invites the coach to complete a Swimming Staff Application which can be accessed below.